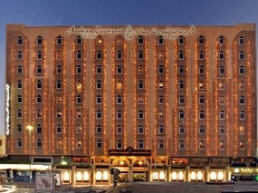 Ideal location in old Dubai opposite the Museum and a stone’s throw away from many historical, cultural and shopping attractions such as heritage village, historic bastakiya, Dubai creek & abra (water taxi), meena bazaar, textile market, electronics shopping, computer street and a whole lot more. Our 4 star Dubai hotel is ideally located in Bur Dubai, a short walk from the Bank Street and Port Rashid with it’s cruise terminal, a short 3 k.m ride away from Sheikh Zayed Road, Dubai World Trade Center & exhibition halls and only 6 k.m away from Dubai airport. The Spice Market and the Gold Souk are easily accessible via the Abra (water taxi).